Raghuram Govind Rajan (Tamil: ரகுராம் கோவிந்த ராஜன்) (Hindi: रघुराम गोविन्द राजन); (born 3 February 1963) is the current and the 23rd Governor of the Reserve Bank of India, having taken charge of India's central banking institution on 4 September 2013, and succeeding Duvvuri Subbarao. Rajan was chief economic adviser to India's Ministry of Finance during the previous year and chief economist at the International Monetary Fund from 2003 to 2007. He is on leave of absence as a professor of finance at the graduate business school at the University of Chicago. Raghuram G.Rajan was born 1963 in Bhopal, Madhya Pradesh in a Tamil family and his father was a senior officer in Indian intelligence agency. He did his schooling from 7th to 12th standard in Delhi Public School, RK Puram and graduated from the Indian Institute of Technology, Delhi with a bachelor's degree in electrical engineering in 1985, after which he acquired a Post Graduate Diploma in Business Administration from the Indian Institute of Management Ahmedabad in 1987. He won Director's Gold Medal in IIT Delhi and was a Gold medalist at IIM Ahmedabad. He received a Ph.D. in Management from the MIT Sloan School of Management in 1991 for his thesis titled "Essays on Banking". After graduation, Rajan joined the Booth School of Business at the University of Chicago. He was the Chief Economist at the International Monetary Fund (IMF) from October 2003 to December 2006. Dr. Rajan’s research interests are in banking, corporate finance, and economic development, especially the role finance plays in it. He co-authored Saving Capitalism from the Capitalists with Luigi Zingales in 2003. He then wrote Fault Lines: How Hidden Fractures Still Threaten the World Economy, for which he was awarded the Financial Times-Goldman Sachs prize for best business book in 2010. Dr. Rajan is a member of the Group of Thirty. He was the President of the American Finance Association in 2011 and is a member of the American Academy of Arts and Sciences. In November 2008, Indian Prime Minister Dr. Manmohan Singh appointed Rajan as an honorary economic adviser. That same year, a high-level committee on financial reforms, headed by Rajan, submitted its final report to the Planning Commission. Replacing Kaushik Basu, Rajan was appointed as Chief Economic Adviser to the Government of India on 10 August 2012. He also prepared the Economic Survey for India for the year 2012-13, on 27 February. On August 6, 2013 it was announced that Rajan would take over as the next RBI Governor. He was appointed RBI Governor for a term of 3 years succeeding D Subbarao whose term ended on 4 September 2013. In 2014 it was suggested that Rajan could take over from Christine Lagarde as head of the IMF when Lagarde steps down in 2016. In 2005, at a celebration honoring Alan Greenspan, who was about to retire as chairman of the US Federal Reserve, Rajan delivered a controversial paper that was critical of the financial sector. In that paper, "Has Financial Development Made the World Riskier? ", Rajan "argued that disaster might loom." Rajan argued that financial sector managers were encouraged to "take risks that generate severe adverse consequences with small probability but, in return, offer generous compensation the rest of the time. These risks are known as tail risks. But perhaps the most important concern is whether banks will be able to provide liquidity to financial markets so that if the tail risk does materialize, financial positions can be unwound and losses allocated so that the consequences to the real economy are minimized." The response to Rajan's paper at the time was negative. For example, former U.S. Treasury Secretary and former Harvard President Lawrence Summers called the warnings “misguided” and Rajan himself a "luddite". However, following the 2008 economic crisis, Rajan's views came to be seen as prescient; by January 2009, The Wall Street Journal proclaimed that now, "few are dismissing his ideas." In fact, Rajan was extensively interviewed on the global crisis for the Academy Award winning documentary film Inside Job. Rajan wrote in May 2012 that the causes of the ongoing economic crisis in the U.S. and Europe in the 2008–2012 period were substantially due to workforce competitiveness issues in the globalization era, which politicians attempted to "paper-over" with easy credit. He proposed supply-side solutions of a long-term structural or national competitiveness nature: "The industrial countries should treat the crisis as a wake-up call and move to fix all that has been papered over in the last few decades... Rather than attempting to return to their artificially inflated GDP numbers from before the crisis, governments need to address the underlying flaws in their economies. In the United States, that means educating or retraining the workers who are falling behind, encouraging entrepreneurship and innovation, and harnessing the power of the financial sector to do good while preventing it from going off track. In southern Europe, by contrast, it means removing the regulations that protect firms and workers from competition and shrinking the government's presence in a number of areas, in the process eliminating unnecessary, unproductive jobs." During May 2012, Rajan and Paul Krugman expressed alternate views on how to reinvigorate the economies in the U.S. and Europe, with Krugman mentioning Rajan by name in an opinion editorial. In an article in Foreign Affairs magazine, Rajan had advocated structural or supply-side reforms to improve competitiveness of the workforce to better adapt to globalization, while also supporting fiscal austerity measures (e.g., raising taxes and cutting spending). Rajan conceded that austerity could slow economies in the short-run and cause significant "pain" for certain constituencies. Krugman rejected this view, advocating instead traditional Keynesian fiscal stimulus (e.g., spending and investment) and monetary stimulus, arguing the primary factor slowing the developed economies was a general shortfall in demand across all sectors of the economy, not structural or supply-side factors that affected particular sectors. This debate occurred against the backdrop of a significant "austerity vs. stimulus" debate occurring at the time, with some economists arguing one side or the other or a combination of both strategies. In a 2014 interview, Rajan said his major targets as governor of the Bank of India were to lower inflation, increase savings and deepen financial markets, of which he believed reducing inflation was the most important. A panel he appointed proposed an inflation target for India of 6% for January 2016 and 4% (+-2%) thereafter. In 2003, he won the Fischer Black Prize awarded by the American Finance Association for contributions to the theory and practice of finance by an economist under age 40. He was awarded the fifth Deutsche Bank Prize for Financial Economics 2013 on 26 September 2013 for his "ground-breaking research work which influenced financial and macro-economic policies around the world". He was conferred the Best Central Bank Governor award for 2014 by Euromoney Magazine. Raghuram is married to Radhika Puri, a classmate from IIM Ahmedabad, who is now a Lecturer in Law at University of Chicago Law School. They have a daughter and a son. Rajan is a vegetarian and enjoys playing tennis and squash. Saving Capitalism from the Capitalists, was co-authored with fellow Chicago Booth professor Luigi Zingales and published in 2004. Fault Lines: How Hidden Fractures Still Threaten the World Economy, published in 2010, has won the Financial Times and Goldman Sachs Business Book of the Year Award for 2010. 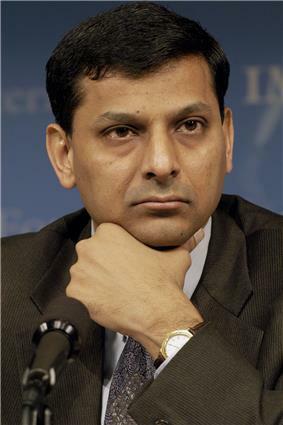 ^ "Chicago Booth professor Raguhram Rajan is named Governor of Reserve Bank of India". 6 August 2013. Quote: "Raghuram Rajan, a professor of finance at the University of Chicago Booth School of Business and the Indian government’s Chief Economic Adviser, has been named Governor of the Reserve Bank of India, the school announced today. While in this post, Rajan will be on leave from the university." ^ "The roots of Recession" Quote: "RAGHURAM RAJAN has always been a little precocious. Arguably the most famous alumnus of Delhi Public School, he was one of the youngest professors at Chicago's Booth School of Business, and, at 40, the youngest chief economist of the International Monetary Fund." ^ Sanjiv Shankaran et al. "Raghuram Rajan is adviser to PM". Mint. 4 November 2008. Retrieved on 18 August 2012. ^ "Raghuram Rajan appointed as new CEA. The Hindu. August 11, 2012. Retrieved on 18 August 2012. ^ Raghuram Rajan. "Has Financial Development Made the World Riskier?". National Bureau of Economic Research. November 2005. Retrieved on 18 August 2012. ^ a b Justin Lahart. "Mr. Rajan Was Unpopular (But Prescient) at Greenspan Party". Wall Street Journal. 2 January 2009. Retrieved on 18 August 2012. ^ Paul Krugman. "How Did Economists Get It So Wrong?". The New York Times. 2 September 2009. Retrieved on 18 August 2012. ^ a b Rajan, Raghuram G.. (2012-05-01) Foreign Affairs-Rhaguram Rajan-The True Lessons of the Financial Crisis-May/June 2012. Foreignaffairs.com. Retrieved on 2012-05-16. ^ Project Syndicate-Raghuram Rajan-Central Bankers Under Siege-May 2012. Project-syndicate.org (2012-05-08). Retrieved on 2012-05-16. ^ Ummelas, Ott. (2012-05-12) Bloomberg-Rehn Rejects ‘False’ Choice Between Austerity, Stimulus-May 2012. Bloomberg.com. Retrieved on 2012-05-16. ^ Project Syndicate-Michael Spence-The Global Jobs Challenge-October 2011. Project-syndicate.org (2011-10-17). Retrieved on 2012-05-16. ^ "Raghuram G. Rajan: Biographical Information". International Monetary Fund. Retrieved on 18 August 2012. ^ "RBI governor Raghuram Rajan receives Deutsche Bank Prize, 2013". Business Standard. 27 September 2013. Retrieved 27 September 2013. ^ a b Rajan, R.G. : Fault Lines: How Hidden Fractures Still Threaten the World Economy. Press.princeton.edu (2012-04-17). Retrieved on 2012-05-16. ^ Our Thinking. Goldman Sachs. Retrieved on 2012-05-16. ^ Business Book Of The Year Award 2010: Longlist announced for the Financial Times and Goldman Sachs | About us | FT.com. Aboutus.ft.com (2010-08-09). Retrieved on 2012-05-16. Full Text of Raghuram Rajan’s first speech as RBI governor, Firstpost.com, 5 September 2013.